Creme Bouquet Flavoring 2 oz. Brand: CK Products 42-452 Units: 2 fl. oz. bottle Add crème bouquet flavoring to cookies, cakes, pastries, and more to enhance the flavors. Artificial. Sugar-free. 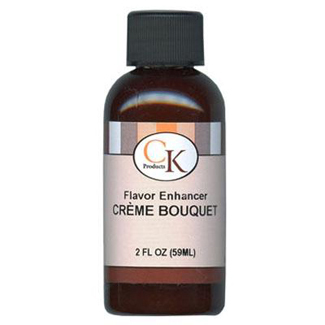 Add crème bouquet flavoring to cookies, cakes, pastries, and more to enhance the flavors. Artificial. Sugar-free. Ingredients: Propylene Glycol, Water, Gum Arabic, Xanthan Gum, FDA Approved Flavors.